Aldon Food Corporation of Schwenksville, Pa., is recalling approximately 18,570 pounds of chicken salad. 5-lb. plastic tub packages containing of “BLOCK & BARREL IMPERIAL” White Meat Chicken Salad with a use-by date from May 22, 2017 through June 27, 2017. 5-lb. plastic tub packages containing of “MARKET SOURCE” White Meat Chicken Salad with a use-by date from May 22, 2017 through June 27, 2017. 5-lb. plastic tub packages containing of “DON’S SALADS” White Meat Chicken Salad with a use-by date from May 22 2017 through June 27, 2017. 5-lb. plastic tub packages containing of “HYMIE’S” White Meat Chicken Salad with a use-by date from May 22, 2017 through June 20, 2017. 5-lb. 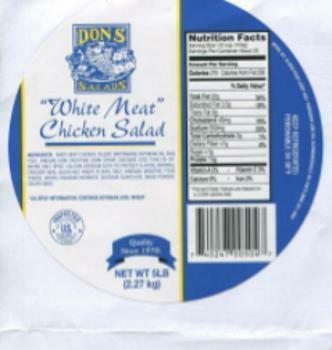 plastic tub packages containing of “DON’S SALADS” Chicken Waldorf Salad Made with White Meat Chicken with a use-by date from May 22, 2017 through June 20, 2017. The recalled products, bearing establishment number “P-8429” inside the USDA mark of inspection, were shipped to distributors in Connecticut, Delaware, Maryland, Massachusetts, New Jersey, New York, Ohio, Virginia and Pennsylvania. Consumers with questions about the recall may contact Deborah Rihs at (888) 321-3667.